Earn $98.32 in VIP credit. Click to Learn More. 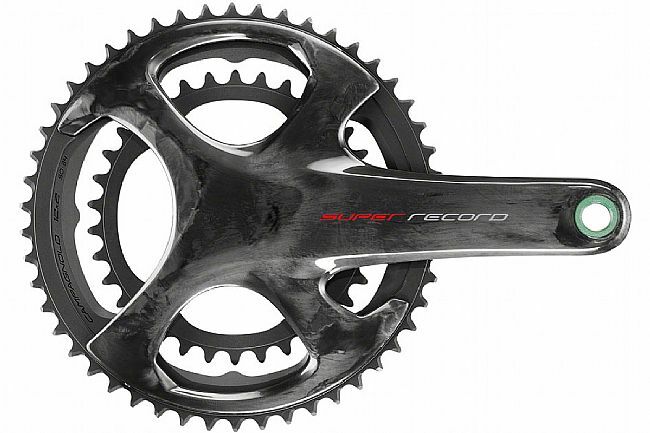 The Campagnolo Super Record 12 speed Crankset has been made lighter, stiffer, and stronger than ever, now accommodating a 2x12 drivetrain. 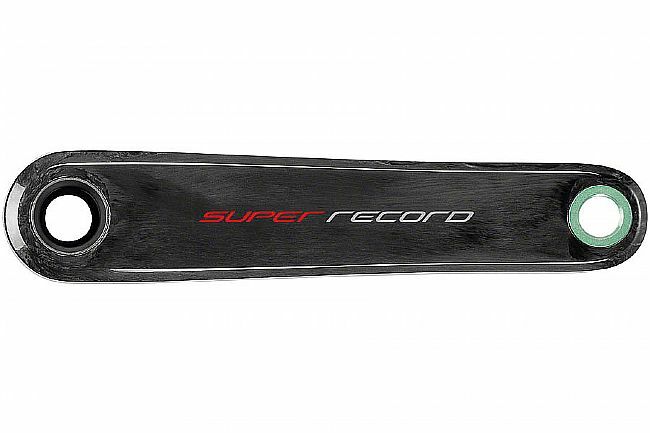 Featuring a carbon fiber construction and Campagnolo's Hollow technology, the Super Record Crankset uses the Ultra-Torque bracket system with a titanium axle to transfer all of the force the athlete applies to the pedal to the drivetrain. 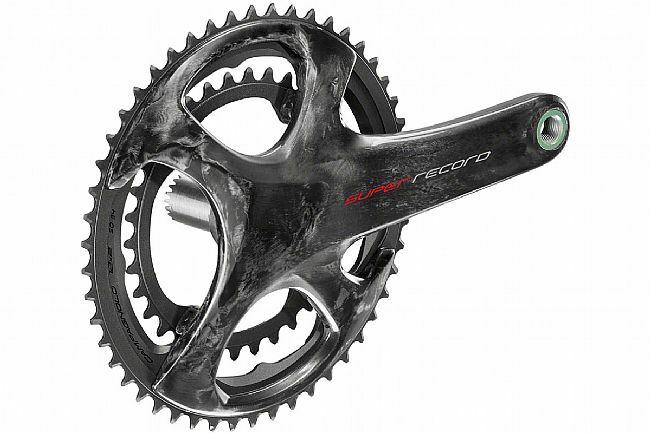 The new Super Record™ 12x2 Speed crankset can be installed on any type of frame, whether or not it is being used with disc brakes because it optimises the chain line on the frame with a rear hub flange measuring 130, 135 or 142 millimetres, without affecting the Q factor, which remains constant at 145.5 millimetres thanks to the new hand crank design. The innovative design of the outer chainring ensures faster, quieter derailing owing to the contoured pin. The symmetrical design of the inner chainring teeth allows improved stability with chain crossovers. The double wheel sizing standards (112 and 145 millimetres) combined with the eight fixing screws, optimises weight and stiffness through the increased use of carbon fibre. The varying number of pins for each of the three chainring combinations (34/50, 36/52, 39/53) facilitates upshifting due to the optimised free strokes associated with each combination. The special drains on the inside of the outer chainrings optimise performance when downshifting in dead spots. Revolutionary new redesign delivers Super Record performance and a 2x12 drivetrain. Universal compatibility with all frame systems, regardless of rear chainstay width. Unidirectional carbon fibre hand cranks, steel axle and aluminium chainrings for stiffness and power transfer. Symmetrical inner chainring teeth for fluid, precise shifts with greater crossover. Optimized design for every chainring combination delivers the maximum performance. Durability-enhancing superficial treatment on chainrings for longer lifespan. Compatible with Ultra-Torque bottom brackets (sold separately). Eight fixing screws for increased stiffness. Claimed weight: 618g (172.5mm, 34-50).